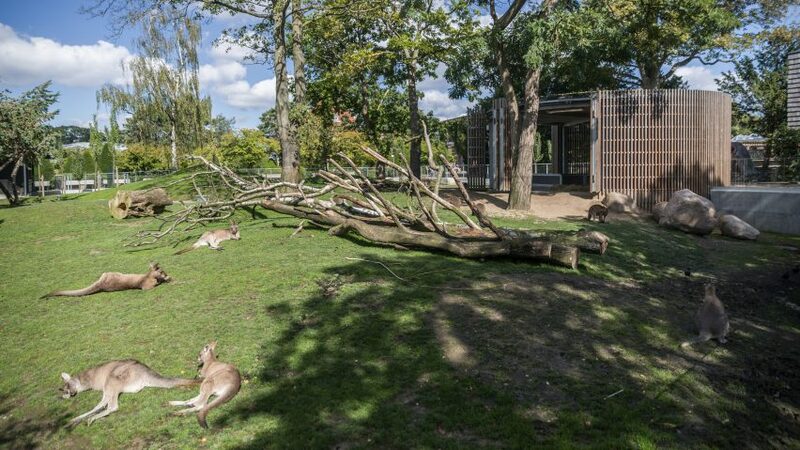 Scandinavian firm White Arkitekter designed this cylindrical house for Tasmanian kangaroos at Copenhagen Zoo to allow visitors to get up close to the animals. White Arkitekter designed the slatted-timber enclosure to allow visitors different levels of interaction with the marsupials, which are smaller in stature than Australia's more famous red kangaroos. Clad in slats of thermal timber and topped by a sedum roof, the steel-framed structure also has a heated concrete floor to provide the animals with a sanctuary from poor weather. "When the Copenhagen Zoo decided to open the new area [named] Tasmania, it faced a well-known dilemma: how can educational institutions and amusement facilities allow visitors to experience the life and behaviour of animals whilst preserving their residents' integrity and shielding them from stress?" said the architects. "Without the barrier of a fence, visitors can meet the kangaroos up close, but on the animals' terms." The interior can be subdivided into different segments that either permit or block access to the animals. One area with steep panels can be used to quarantine diseased animals, while another is an entrance and exit area containing a sluice that means visitors can enter the building without the kangaroos escaping. A further kangaroo-only area surrounded by a low fence opens onto an outdoor space, while the final section is reserved for shy kangaroos, allowing them to retreat completely away from visitors. Slatted timber doors can be folded back to open the house to the larger enclosure, which features felled trees and patches of grass. White Arkitekter, which has offices across Sweden, Denmark, Norway and England, ranked 186th in the list of architects who made it onto Dezeen Hot List – a guide to the most read about architects, designers and institutions of the last year. Last summer, the firm won a competition to design a sustainable housing development on a sloped, uninhabited hillside in the Faroe Islands. Its past projects include a timber and glass extension to a Japanese-style hotel in Sweden and a corrugated copper school in Norway. It is not the first well-known firm commissioned to design an enclosure at Copenhagen Zoo – Foster + Partners designed the Elephant House, which completed in 2011. Photography is by Signe Find Larsen.